Darwin’s theory of natural selection, along with tales of swooping blue-footed boobies, lumbering giant tortoises and bobbing marine iguanas have all contributed to the Galapagos Islands’ status as one of the most prized wildlife-watching destinations in the world. Even with sky-high expectations, the first-time visitor to the Galapagos is never disappointed; it is almost impossible to anticipate the sheer wonder before experiencing this isolated archipelago with your own eyes. Located more than 600 miles from the coast of Ecuador, each of the 13 remote volcanic islands has its own unique landscape. Moon-like lava formations, lush highlands, tropical beaches and cactus forests are home to an abundance of often endemic creatures. To make your visit even more pleasurable, the wildlife appears to be fearless, inquisitively approaching you rather than the other way around, allowing some of the closest encounters possible with nature. 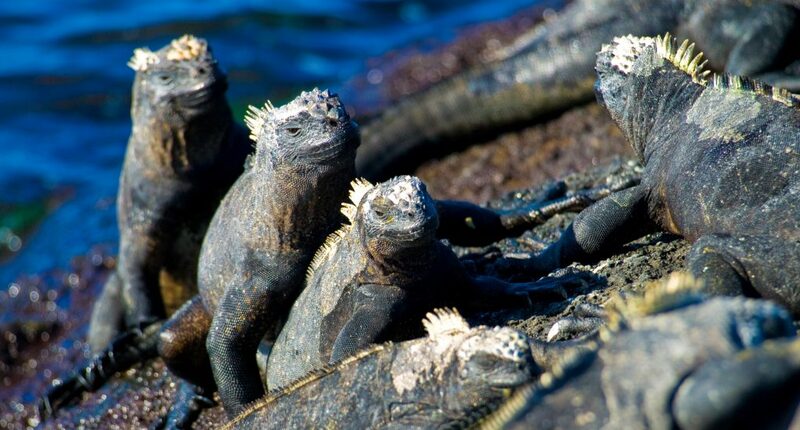 If you are taking a Galapagos cruise, all food will be included during your time on board. You will not go hungry and will be extremely well fed: local ingredients are generally simple but fresh and tasty. Typically, meals are served in a buffet style and are a sociable experience where you can dine with other guests. On some of the more luxurious or small boats you may be served set menus or even have a choice of menu. Please let us know in advance if you have any dietary requirements; vegetarians can usually be accommodated on most boat. In the small towns of Santa Cruz, San Cristobal and Isabela you’ll find a selection of visitor orientated cafes and restaurants. Outdoor tables often stretch out onto the streets, where you can soak in the relaxed Galapagos vibe and catch sightings of passing wildlife. As you may anticipate, seafood is plentiful as well as some of the usual Ecuadorian and South American staples. 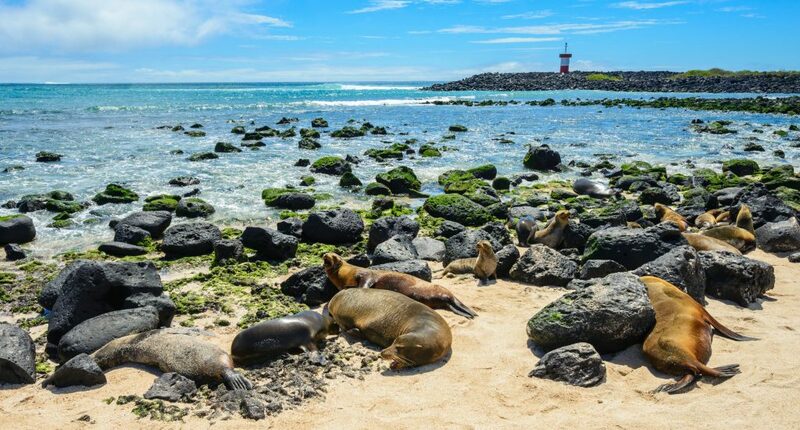 You can visit the Galapagos at any time of the year, fortunately there is no specific window to rule out when planning trips. If you do have flexibility, our favourite months to travel fall between November and June. During this time you’ll experience more of the warm and wet climate (January to May), rather than the cool and dry season, when the water can get chilly (June to December). It is worth nothing that high season in terms of visitor numbers (June to September) is not the ideal time to travel. Although weather in mainland Ecuador can be more pleasant, the Galapagos can get especially busy during these month. Even more importantly, the water can be choppier at this time of year due to arrival of the Humboldt Current. It is important to note that while trips can occasionally be booked at short notice, the best value boats navigating these islands often become fully booked up to a year in advance. The Galapagos and Ecuador are not connected to the UK by direct flights. Most flights to Ecuador’s capital city of Quito will transit through a European hub such as Schiphol, Madrid or Paris. Taking in connection times in between flights, the travel time is usually between 13-15 hours to Ecuador. 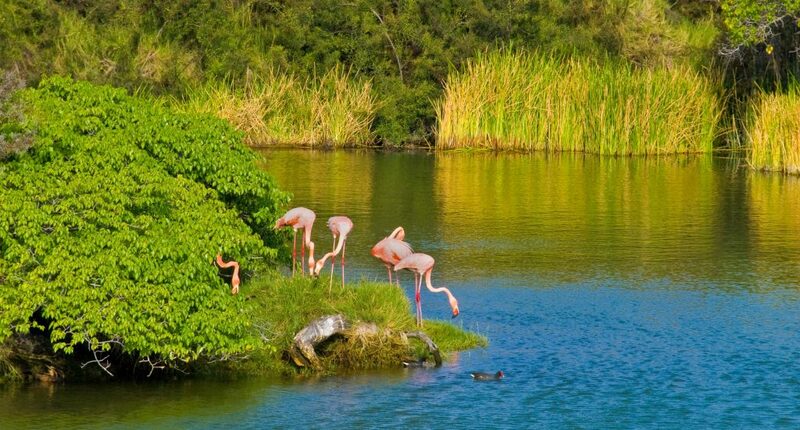 We would recommend having a minimum of two nights in Quito before you visit the Galapagos. The Galapagos are connected to Quito by three domestic airlines. Flights have a touchdown in Guayaquil on route, and the flying time usually is two to three hours. 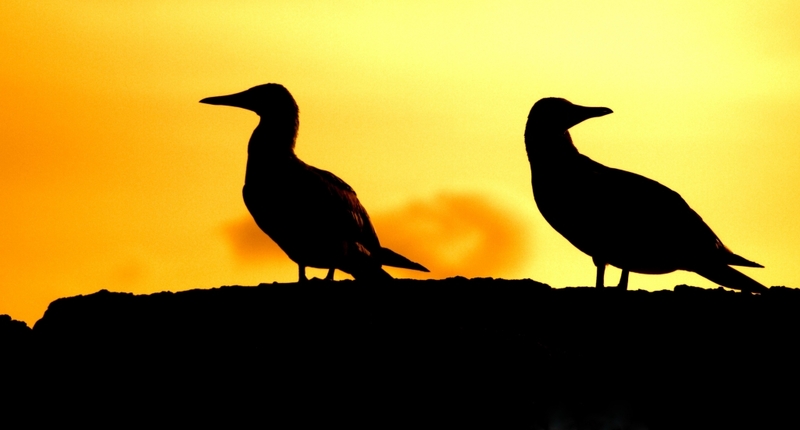 UK and European passport holders don’t require visas the Galapagos for stays up to three months. Six months’ passport validity is required as well as return flight tickets. From February 2018 tourists are required to take out adequate health insurance when visiting Ecuador. It is worth having a copy of your details to hand in case these details are requested. 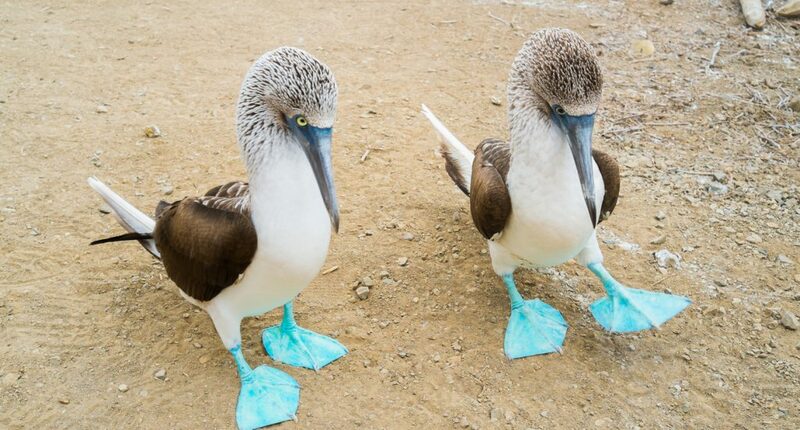 Please note there are two compulsory entry charges for trips to the Galapagos. The first is a transit control tax of $20pp, payable at the airport on departing the mainland. 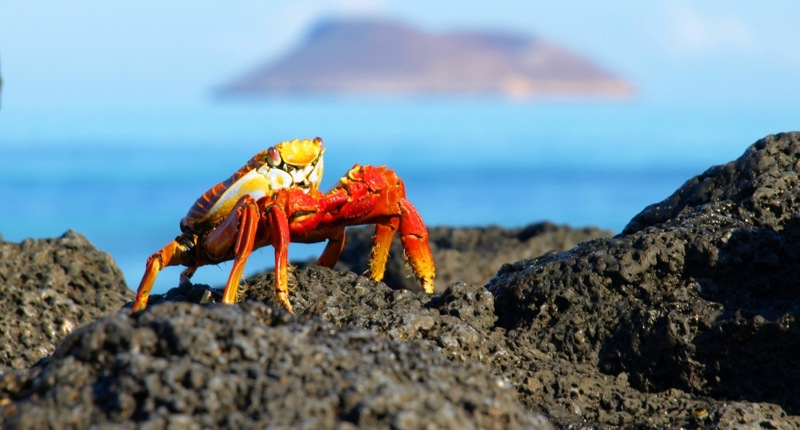 The second is the hefty $100pp National Park entry fee, payable on arrival in the Galapagos. Please note this must be paid in cash, and $100 bills are not always accepted. 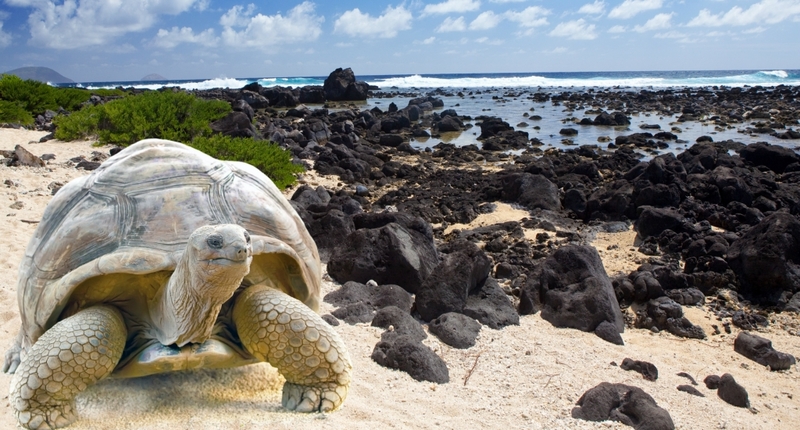 The Galapagos authorities are constantly revising their entry requirements. The latest detail requested by the authorities is blood type for visitor. Please note that not one of our clients has been asked for this information to date, but be prepared that you may still be asked! South America has a reputation as a dangerous part of the world to visit. 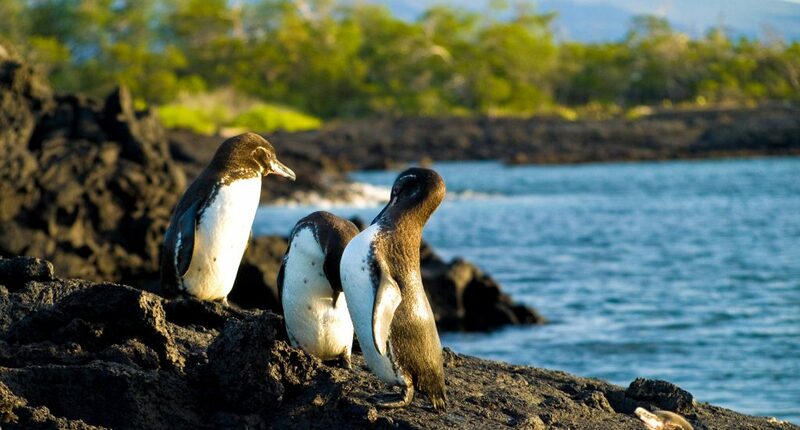 Whilst crime rates in Ecuador are above the world average, the Galapagos Islands are very safe. We would advise taking sensible precautions in the towns, such as not being flashy with expensive jewellery and cameras. Self-driving is not something we recommend in the Galapagos. Roads are of a very poor standard, while car hire is expensive and we find that there are many unwritten rules on the Ecuadorian roads which can make driving in the country a little unpredictable! Adding to this, our reliable and friendly local drivers and guides offer great value for money. Quite often they make impromptu stops and can add to the enjoyment of getting from A to B. As we’re not medical experts we feel it is essential you contact your doctor regarding vaccinations for travel to the Galapagos and Ecuador. What follows are suggestions, but please note they must be verified by a medical professional. General: vaccinations required are the same as you’d routinely have in the UK, so make sure these are up to date. The Travel Doctor, is an interactive website providing specialist health information for travellers plus customised lists of travel medicines, vaccines and malaria tablets for holiday makers, global adventure travellers and expeditions. Please note that a G.P. will usually write you an exemption note if you are over 60 years old. Malaria: the risk of contracting malaria in the Galapagos is extremely low, although it does exist in areas of Ecuador below 1500 metres. Zika: fortunately, confirmed instances of the Zika Virus have been limited compared with other countries in the region. At the time of writing, the latest advice from the World Health Organisation does not place any restrictions on travel within the country. Mosquitoes that spread Zika usually do not live at elevations above 2,000 meters because of environmental conditions so this is worth bearing in mind. Sun: the equatorial sun is extremely strong, so always take high sun cream and apply liberally. Altitude: it is worth noting that much of mainland Ecuador is above 2400 metres, and it is likely you will visit Quito before your time in the Galapagos. Altitude affects people differently, but generally it is rare that people experience significant problems in Ecuador. Drink lots of non-carbonated water, avoid too much alcohol, eat light meals and take things slowly while you acclimatise. Breathlessness and a slight headache are common, but if you experience extreme dizziness or severe headaches do let our local agents know. Acute Mountain Sickness (AMS) is extremely rare but can be a very serious condition. Travel insurance: it is vital you check your travel insurance, as some policies exclude altitudes of more than 2000 metres. You may have to pay a small additional charge to cover you so it is worth checking. In 1999 there was near financial collapse in Ecuador when the Sucre, the century-old currency, took a huge nosedive in value. In 2000 the currency was abandoned completely to bolster stability within the country, and Ecuador’s official currency is now the US dollar. It is worth taking US dollars with you or withdrawing cash directly from ATMs; it can be difficult to change other currencies locally. It is important to avoid bringing large value ($50 or $100 bills) or ripped notes, as these can be tricky to use in the country. Galapagos park fees, certain boats and smaller restaurants in the Galapagos will not take credit cards. When boats do take cards it is usually better to bring cash to add the additional 14% taxes that get added to tips on board. Credit cards are widely accepted in Santa Cruz and San Cristobal only, but it should not be relied upon. Tipping is very common in Ecuador, so do keep hold of smaller notes when you get them so you do not get stuck with larger bills. We would advise adding roughly 10% in restaurants, which should be given directly to the waiting staff. Guides always appreciate tips, roughly $10 per day would be appreciated and around half this amount for drivers. 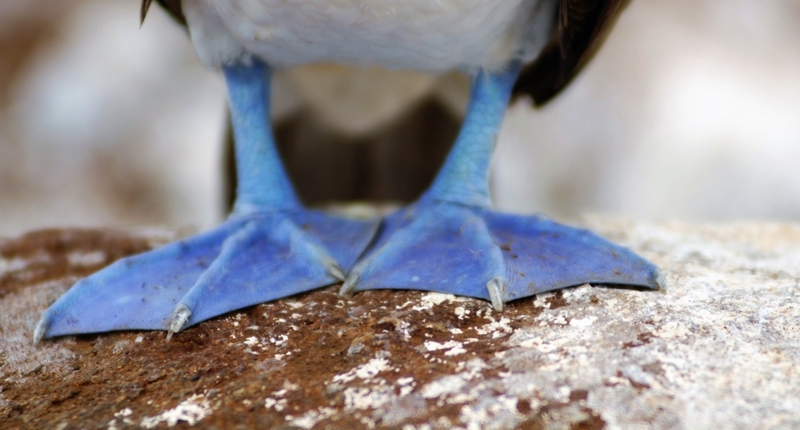 In the Galapagos, cruises can ask for extortionate amounts in their tipping guidelines. We feel that between $10-20pp per day is the rough amount to be aiming for. It is important to remember that tipping is a very personal thing, and if you feel someone deserves more, or even no tip, then that is entirely your prerogative and you should not feel bound by these suggestions. – We provide all of our clients with a “Travel Facts” document upon confirmation of your booking. This details useful facts and travel advice for your chosen destination, including restaurant recommendations, reading tips, basic language, cultural traditions, climate information and brief historical overviews. We feel that this offers a useful insight into the country you are visiting, and can help you interact with local residents in a more sensitive, well informed manner. Please try to take the time to read this information before your visit, if at all possible. – A number of the countries in which we operate holidays are religious societies with a widely observed set of customs. Always respect these norms, particularly when visiting religious buildings. – To the best of our knowledge, all of the hotels, lodges and camps within our portfolio operate stringent measures to minimise water usage. Many of our destinations have issues with water supplies to a certain extent so feel free to raise any possible wastage should you encounter it during your stays, either with the accommodation or with us upon your return. – Please ask before taking photographs of people, and respect their wishes should an individual not be happy to be photographed. We find that friendly requests and a smile are usually met with assent. – Strive where possible to make your own contribution to environmental practices within the destination you are travelling. This might include minimising your electricity usage, avoiding smoking in protected areas, sticking to marked roads at all times while self-driving, avoiding coral while snorkeling and safely disposing of all litter (recycling where possible). – Where possible, try to purchase from local suppliers. This includes shopping for souvenirs, eating out in restaurants and booking further excursions during your free time. In areas where haggling is an accepted part of daily life, don’t become angry or offended if you are unable to obtain what you perceive as a fair price for an item. We emphasise to local suppliers that our clients should never be taken on unsolicited shopping trips, but if this does happen, try to retain your sense of humour, provide a firm refusal to participate and tell us about this on your return. We pass on all feedback from every trip undertaken with Holiday Architects to the relevant local suppliers, who share our commitment to travelling with sensitivity. – Please don’t remove any indigenous items from their natural habitat and attempt to bring them back as a souvenir. This particularly applies to coral, shells, plants and food in the natural world, and to cultural artefacts and antiques. – If you are unsure about anything relating to the above, please feel free to ask our local suppliers or your Holiday Architects specialist. All of these people either live or have travelled extensively in the country you are visiting and will be more than happy to offer their considered advice.